MANCHESTER, N.H. — Retired MBTA Transit Police Sgt. Richard “Dic” Donohue gave remarks today at the New Hampshire Association of Chiefs of Police Annual Conference and Trade Show. Sgt. Donohue’s talk, entitled, “Lessons Learned from a Critical Injury: A Wounded Officer’s Perspective,” will hopefully spur discussion on the need for critical and immediate care during an active shooter response and the need for better preparation for officers and their families for critical injuries. Sgt. Donohue was one of six law enforcement officers invited to speak during the convention. • Department support and how executives can prepare their organization for the unique challenges of a critical injury. Sgt. Donohue also includeed input from other officers who, like him, have been critically injured in the line of duty. The desired outcome of his presentation is to give police executives an understanding of the challenges that they may face in supporting a wounded officer, and give them tools to best prepare for this situation. Sergeant Richard “Dic” Donohue is a native of Winchester, Massachusetts. He began his law enforcement career in 2010 as a member of the MBTA Transit Police Department. Donohue is a graduate of the Virginia Military Institute and holds master’s degrees from the University of Massachusetts-Lowell, and the University of Limerick, Ireland. Prior to a career in law enforcement, Sergeant Donohue worked in the hospitality industry and served as an officer in the United States Navy. After two months in hospitals, Donohue returned home where he continued rehabilitation. He returned to the force after 23 months and shortly thereafter was promoted to the rank of Sergeant. For his actions in Watertown, he received the state’s highest law enforcement award, the George L. Hanna Medal of Honor, and the department’s highest award, the MBTA Transit Police Medal of Honor. 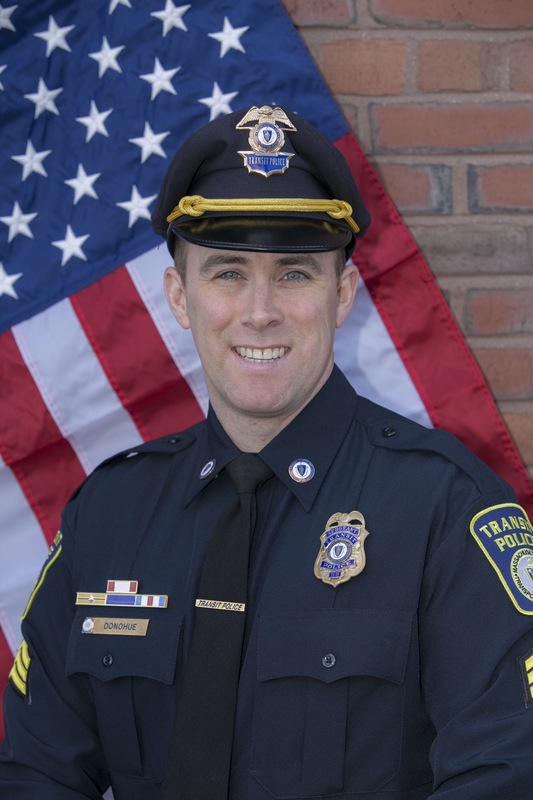 Sergeant Donohue has been recognized by over 20 law enforcement and civic organizations for his involvement following the Boston Marathon Bombing, and his role in community service. Sergeant Donohue recently retired from the MBTA Transit Police Department due to his line of duty injuries. Over the last three years, Donohue has brought his story of survival, resilience and adaptability to police academies, law enforcement executives, students and private sector audiences. He also serves as a board member for the American Red Cross. Sergeant Donohue maintains a close connection with law enforcement and is an adjunct professor in criminal justice at Fisher College. He currently lives outside of Boston with his wife and son.